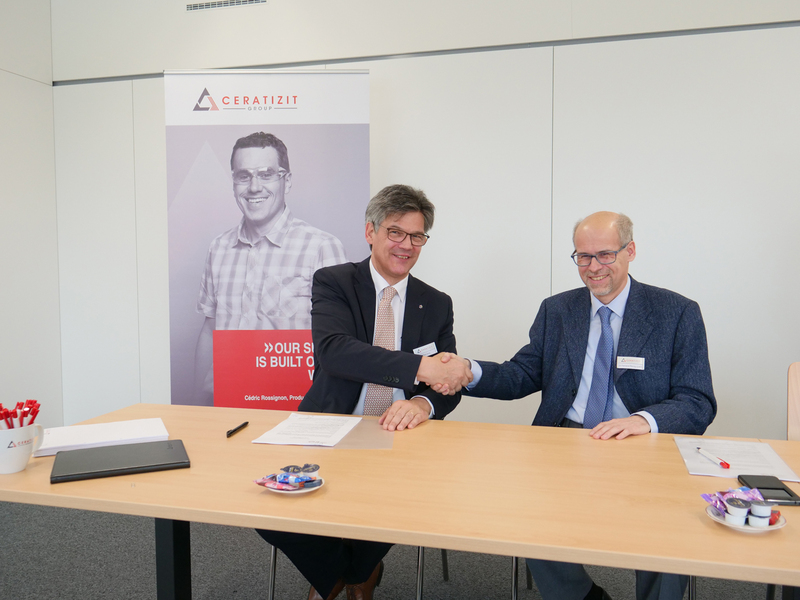 LIST and CERATIZIT have committed, between now and 2020, to developing physical vapour deposition coatings for the manufacturer’s future cutting tools dedicated to the machining trades. On 5 December 2017, the Luxembourg Institute of Science and Technology (LIST) and the Luxembourg-based company CERATIZIT signed a three-year collaboration agreement. Within the framework of the NANOPIMS research project, funded by the Luxembourg National Research Fund (FNR), the two partners have committed to a mutual aim: developing new physical vapour deposition (PVD) coatings that perform at high temperatures, exceeding 850 degrees Celsius, for high-speed machining technology. They plan to achieve this goal by October 2020, the project’s end date. The machining trades are not only seeking to optimise costs but also to reduce environmental risks to the maximum by using as little lubricant as possible. Thus, two major trends are emerging on the cutting tools market: ‘green machining’ associated with the concept of reducing the amount of lubricant used (Minimum Quantity Lubrication – MQL), or near-dry machining, and an increased demand for PVD coatings that can withstand high temperatures. Consequently, during cutting activities, the tools are faced with an increased surface temperature and a reduced lifespan. CERATIZIT carbide experts and LIST researchers specialising in thin film deposition and reactive composite polymers, together with surface analysis experts, will pool their skills and experimental facilities to address this issue. They will endeavour to optimise both the composition and microstructure at the nanometric level of the coatings currently deposited on the tools used by the industry, which are a few microns thick and made from titanium nitride and aluminium, in order to increase their operating temperatures whilst preserving equivalent performance. In particular, they will look at chemical composition, microstructure and adhesion, as well as the final coating’s resistance to plastic deformation, and wear and tear. Whilst the analyses, mechanical tests and surface characterisation activities will be carried out in the LIST laboratories in Belvaux, the machining tests will be conducted at the CERATIZIT Group facilities. A true challenge, which could eventually lead not only to a 15-30% improvement in the lifespan of the cutting inserts produced by CERATIZIT but also provide additional knowledge about improving PVD coating resistance to oxidation and wear and tear at high operating temperatures. benefit this new research project.